and what do you think about funding us? Or we'll give it to you. 'Hey, we don't need you. You haven't got through college yet.'" General Economic Perspectives: Recession, Anyone? A college degree holds a certain esteem in our culture. So much so that First Lady Michelle Obama has encouraged all kids to seek higher education. But does a college degree still hold the promise we’re told it does? • A 50-day suspension from SGA, which is unpaid (she currently receives a stipend of about $700 a month). • A requirement to attend a three-day diversity workshop in mid-August. • A requirement to attend three “UH cultural events” each month from September through March, excluding December. • An order to write a “letter of reflection” about how her harmful actions have impacted SGA and the UH student body. In a preemptive strike against such so-called microaggressions, several institutions of higher education are now using orientation to train incoming freshman about subtle insults, trigger warnings and safe spaces. In a survey of hiring managers, 75% of respondents said that Millennials, including those with college diplomas, are not prepared for the working world and lack an adequate work ethic. Another 62% of respondents said their lack of preparedness impedes day-to-day business productivity. Also noticeably absent from younger employees’ skillset, according to survey respondents, are communication and interpersonal skills, skills that employers today deem as important as technical skills, if not more important. Much has been written about over-skilled college graduates working as bartenders and Starbucks baristas because they cannot find the higher-skilled, higher-paying jobs their college degrees promised. 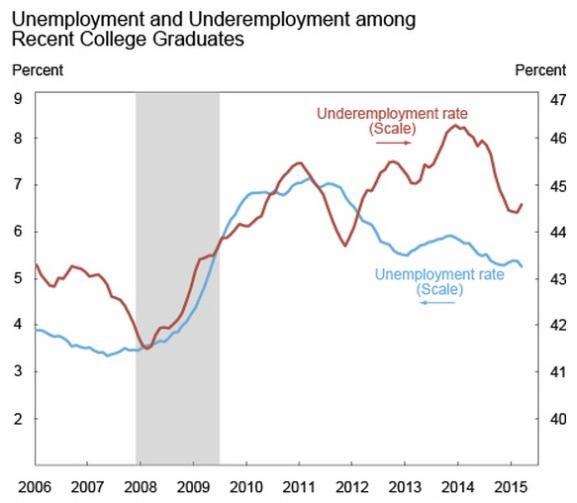 The unemployment and underemployment rates for recent college grads (defined as between ages 22 and 27 with a bachelor’s degree or higher and not currently in school) have improved in the past couple of years. But as the red line in the following chart shows, more than 44% of young college graduates still have more education than their current jobs require. By comparison, that figure was 38% in 2000 and 41% in 2007. 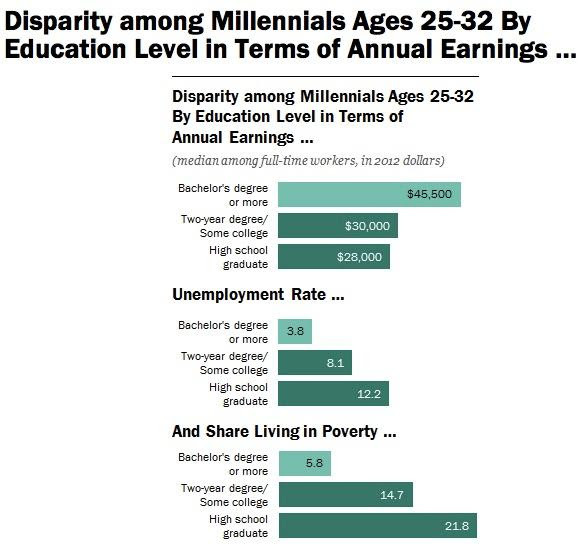 Millennials at large still make up about 40% of those unemployed. Forty-three million Americans currently hold $1.3 trillion in student debt loans. In 2004, total student loan debts amounted to $260 billion. Today, $43 billion of total student debt is held by people over 60, 5% of whom are using Social Security income to pay down student debts. The average class of 2016 graduate owes $37,172 in loans, up 6% from 2015 and 12% from 2014. The delinquency rate amongst these debt holders is over 11%. These loans are and will continue to hang over today’s graduates, as debt impacts their ability to buy homes, start families, launch companies, invest and consume. As part of the 2005 Bankruptcy Abuse Prevention and Consumer Protection Act, student loan debt was made dischargeable in bankruptcy, meaning student debt cannot be forgiven in bankruptcy. This caused a huge spike in banks getting in on the school loan business, which drove up tuition that much more, which necessitated more loans. And then in 2010 and included in the Affordable Care Act was a measure that nulled prior policy of the government guaranteeing private loans. In its place, was a policy of increased direct lending from the government; today the government delivers 90% of all student loans. The spate of loan policy changes in the past decade is driving the fear that student debt is the next bubble to burst. 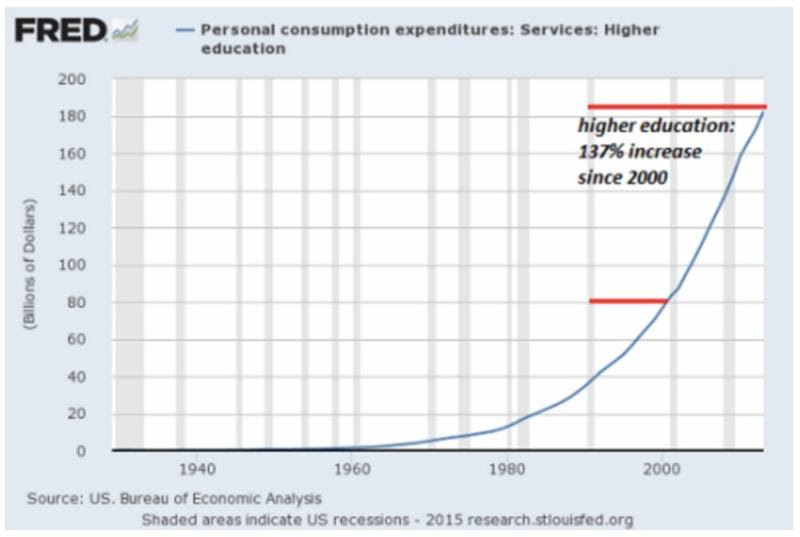 A massive driver of education inflation and tuition costs is the increase in the number of university and college administrators and bureaucrats. 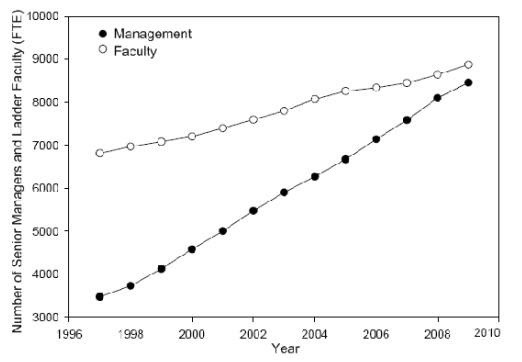 Their numbers have doubled on college campuses in the past 25 years, far outpacing the growth in faculty (and students), as shown in the following chart. Between 1987 and 2012, 517,636 administrators and professional employees were hired in American higher ed institutions. Private universities have added 12 employees for every 1,000 students since 1987. For every full-time, tenure-track faculty member, there are now two nonacademic employees at public and two and a half at private universities and colleges, marking a doubling of this ratio. Public university systems have grown their central office employees six-fold since 1987, with the number of administrators in them growing by a factor of more than 34. According to a report from Fidelity, a record 72% of parents are saving for their children’s college education, up from 58% in 2007. But their savings cannot track the rate of college tuition increases. On average, parents are expected to reach only 29% of the savings goals (the average goal being 70% of a child’s higher ed costs) by the time their first child enters college. At the same time, more and more colleges and universities are sitting on ever fatter endowments, a fund of donated money that the school can invest and spend, with some restrictions, as they see fit. What is going on with our higher education system? A word comes to mind. Dysfunction. Or rather, two words: widespread dysfunction. We have the discussion-slash-distraction of safe spaces and micro aggressions and a concern over how colleges and universities stifle free speech and promote only specific, sanctioned viewpoints. There’s the perception that schools coddle students and, thus, prohibit the maturation of interpersonal and communication skills that employers, while also making them grossly unprepared for the real world, where they cannot be shielded from every “offending” perspective. We have colleges and universities failing to prepare graduates for the job market that awaits them, the effects of which are and will continue to cascade across the entire economy and impact us all. All the while, schools are saddling students with crushing debt to cover huge administrator payrolls and the campus construction arms race. While, in many cases, these institutions are sitting on hundreds of millions and billions of dollars in endowments and tax exemptions, as we all nervously watch the student loan debt bubble get bigger and bigger. One has to ask: is college worth it anymore? We explore this question further in A Closer Look: Widespread Dysfunction in Higher Ed. Are we headed into a recession? Numerous economic data suggests the U.S. economy has been slowing for several quarters. Just recently auto sales lost their momentum. And not withstanding the July employment print of 271,000 new jobs, one month later we fell back into what seems a more challenged job market, with 151,000 jobs added in August. After the dot.com bubble burst in 2000, we experienced a recession (2001/2002). And after the housing bubble burst in 2007, we experienced a recession (2008/2009). Shouldn’t we now expect to experience a recession because the oil and gas bubble has burst? Let’s look back at another pattern. Early in Richard Nixon’s presidency, we experienced a recession (1969/1970). Early in Ronald Reagan’s presidency, we experienced two recessions (1980 + 1981/1982). Early in George H.W. Bush’s presidency, we experienced a recession (1990/1991). Early in George W. Bush’s presidency, we experienced a recession (2001/2002). And early in Barack Obama’s presidency, we experienced a recession (2008/2009). Odds look very high that soon after taking office, our next president will experience a recession. No wonder the Fed wants to raise interest rates. At current rates, they have very limited stimulus tools. Maybe that’s why at the recent Jackson Hole monetary policy conference there was actual conversation about negative interest rates. A recent request for Doug to speak at a trade association annual gathering had him researching their preferred topic. In doing the research, Doug stumbled upon some rather unexpected conclusions. To view the presentation and learn the discovery he stumbled up, click the link below. If birds of a feather flock together, then might we conclude that birds together become of one feather? Did your parents ever tell you to be careful of the company you keep? If who we are is a product of both our nature (inherited genetic predisposition) and nurture (the environment that surrounds us), then maybe we should be mindful of the people and ideas we surround ourselves with. As Andrew Carnegie, one of America’s early titans of industry, suggested, we are what we think, and what we think is a function of the world we choose to live in. The operative word here is “choose.” We have a choice to be who we want to be, so use that free will as well as you can. In 2008-09, 82% of all first-time, full-time degree/certificate seeking undergraduate students at 4-year degree-granting postsecondary institutions received some kind of financial aid. In the 2013-14 school year, that number is higher at 85%, according to the National Center for Education Statistics. The following chart shows the percentage of first-time, full-time undergraduate students receiving financial aid at 4-year, degree-granting postsecondary institutions, by type of financial aid (federal grants, state/local grants, institutional grants, student loans) and control of institution (public, private nonprofit, private for-profit) for the 2013-14 academic year. The BLS took a look at the state of employment for postsecondary education administrators, which they define as overseeing student services, academics and faculty research. Job duties can also extend to areas of admissions, student life and the office of the registrar. Between 2014 and 2024, the BLS projects that employment in this category will grow at an above-average rate of 9%. In the same period, the average growth rate for all occupations is projected to be 7%. 2015 median pay for postsecondary education administrators is nearly $90,000 per year. Click here or the chart for the full outlook report. There’s the “shrieking girl” who yelled at a Yale professor to “be quiet” and step down for failing to create a “home” at Yale, as, in her view, colleges should not be about creating “intellectual spaces.” The professor’s offense was that he and his wife jointly wrote an email defending students’ rights to wear stupid, even offensive Halloween costumes. Their suggestion to students was to “look away” from an offensive costume or start a dialogue with that person. The professor and his wife recently stepped down as heads of Silliman College, a Yale residence where they served as social and intellectual mentors to students. Just this past month, Princeton’s human resources sent a memo announcing policy to avoid using the word “man,” and instead use more “gender inclusive language,” like human being or person instead of man, artificial instead of man made, person hours instead of man hours, ancestors instead of forefathers, etc. 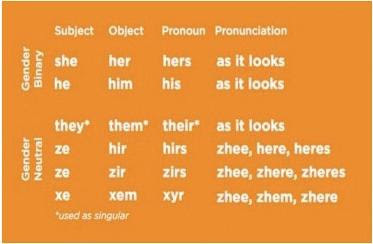 Not too long before that, the Office of Diversity and Inclusion at the University of Tennessee, Knoxville emailed a chart of “gender neutral pronouns” (below) to be used because gender should not be assumed by appearance. There’s much online fodder that suggests colleges and universities have lost their minds when it comes to political correctness and kowtowing to the demands of the so-called “snowflake” students, who “melt at the mere mention of even a potential abrasion of their sensibilities,” as George Will put it in a Washington Post op-ed. A deeper look suggests that the insanity on campuses is more media hysteria than pervasive. It’s true that student demands over political correctness are causing many schools to discuss just how free speech should be on their campuses, and some are making controversial decisions. But it also appears true that most schools do not require trigger warnings or kowtow to demands over microaggressions. Fewer than one percent of professors responding to a survey from the National Coalition Against Censorship said that their schools had formal trigger warning policies. That said, the debate in media is forcing schools to self reflect; many schools are beginning to feel the heat from alumni who are showing their disgust for political correctness run amok at their alma maters by withholding donations. In part, it’s a question of semantics. College and universities have had designated buildings for people of certain races, religions, genders and sexual identities to congregate for decades. It is only recently that these places have become broadly known as “safe spaces.” In deeming something a “safe space,” it suggests that everyone and everything outside of it is somehow unsafe. In retreating to a “safe space,” people can be painted—in the minds of those inside and outside of the safe space—as victims of some assault. Arguably, victim status is chosen and doubled down on. By throwing such a loaded term on these spaces that were once known as places where people of similar backgrounds could gather for any reason, they risk segregating students and becoming inherently divisive and controversial. Is that necessary? Is that good for open, respectful dialogue and understanding? Did the University of Chicago attack academic freedom? Meanwhile, endowments at scores of schools are in the billions and hundreds of millions, drawing ire from local communities. Citizens are expressing frustration when local schools’ tax-exempt status means they don’t generate tax revenue for their communities and still leave some graduates with debt. 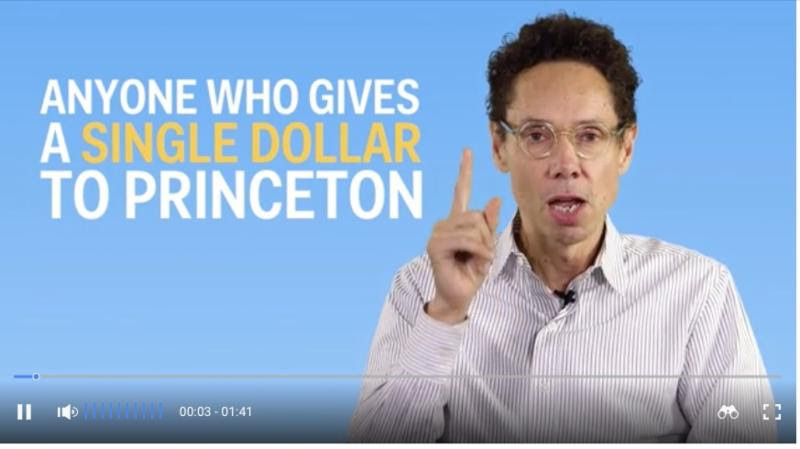 Gladwell notes students and parents shape the spending decisions on any given campus. Noting the differences in how similar schools spend money, he claims that Bowdoin spends its marginal dollar on extravagant amenities (a claim Bowdoin denies), where Vassar directs its marginal dollar to financial aid for poor students. A ProPublica analysis found that more than 25% of the nation’s 60 wealthiest universities leave their low-income students owing an average of more than $20,000 in federal loans. There’s a self-perpetuating cycle of “administrative bloat” and student services on many higher ed campuses, where schools are hiring more administrators, which is driving up the cost of tuition. As education becomes costlier to the student, they (and their parents) view themselves more as customers and place higher service and treatment demands. In turn, more administrators are hired to meet service expectations. And then students are further emboldened in what they expect for their investment. Yet one has to wonder, when so much money is pouring into new administrator hires and less so into faculty (whose salaries were flat between 2000 and 2012), what kind of return on investment are students getting? Is it learning? Or is it improved services? What is a college’s or a university’s mission? To provide services? The purpose of college has historically been to prepare students for success in careers and life. Are colleges and universities delivering on that purpose today? Technology has killed off and disrupted entire industries, rendering all kinds of jobs obsolete or now deemed low skilled. It’s facilitated globalization through the exportation of what used to be mid-skilled, middle-waged jobs overseas, like manufacturing and customer service, devaluing those skills along with it. Robotics and artificial intelligence will continue to come after middle-waged jobs, and even higher-skilled, higher-paying jobs. An ultimate effect of technology is that it’s pushing more jobs into the higher-skilled and lower-skilled ends of the spectrum at the expense of middle-waged and mid-skilled jobs. Jobs that the job market rewards and values today require creativity and problem-solving skills, as well as the ability to work well with cross-functional teams. An ability to use and adapt with changing technologies is also important. Those who can score these higher-paying jobs in the expanding high-skilled job market are fueling the growth of lower-skilled, lower-paying jobs like restaurant workers and services that support the wealthier class. In the twentieth century, the school system aligned nicely to the predominantly rote-skill-based job market. Education was taught in subjects. Teachers and professors were grouped by department. Schools taught students subject knowledge and how to think in rote, linear ways. The school structure mirrored the structure of the also siloed and neatly department-ed twentieth-century model of business that required subject knowledge and routine tasks. With education delivery preparing students for the average company structure in the twentieth century, most higher ed institutions could at least promise to prepare graduates for the middle class. But today, the middle class is being hollowed. In this century, the world is interdisciplinary, technology-driven and globalized. Companies are flatter, nimble and require flexibility and adaptability from their workers. But schools are still structured as they were last century. Most universities and colleges have not adapted, as proven by how many still instruct in categories, just as they did last century. Few provide their students with practical skills relevant to today’s working world and in line with what employers want. Job numbers reveal the mismatch between what higher ed provides its graduates and what they need for successful careers. The changing economy is proving that the historical mission of higher ed to matriculate enlightened adults is now at odds with its promise also to prepare graduates for careers. This debate, an identity crisis of sorts, is real, not rhetorical, as many are questioning if college is worth the astronomical expense, particularly when graduates leave with into the tens of thousands of debt and the promise of a low-skilled, low-paying job. Some colleges are distancing themselves from the old mission of "enlightening" students and instead focusing on career preparation and weighing options to better structure and align themselves to the changed job market. Georgetown is experimenting with a curriculum that merges an undergrad degree, a master’s degree and related work experience all in one integrated experience. At Arizona State University, some students are no longer sitting in traditional classes, but gaining their major’s skillset through a series of hands-on projects. A Pew report found that college graduates are still more likely to win higher-paying jobs and earn higher salaries. But those are the ones lucky enough to get those jobs. So long as colleges are supplying graduates with skills that the job market doesn’t want or have enough demand for, it’s only prudent to question the value of higher ed and the debt that often comes with it. Before those in the Bernie Sanders revolution promise “free” college for all, it’s only prudent to wonder if college itself can provide a return on that investment for both the graduates and the taxpayers. Before we ask taxpayers to pay for more education for more people, it’s only prudent to consider what economic role endowments can play to that end. It’s only prudent for the college-seeker to question the type of higher ed opportunity to seize. A STEM education? A liberal arts education? This major, or that major? Every American is paying for college, even if we do or do not go. It’s only prudent that we no longer take college for granted. Investors would be wise to focus on the implications an aging population will have on long-term policy rates, rather than obsessing over the Fed’s next short-term move, says Blackrock Managing Director Rick Rieder. Citing a demographic evolution that’s taking a haircut off normal run-rate levels of growth and technology that is fundamentally changing the economy, Rieder is encouraged by recent mentions of longer-term rates from both the San Francisco and Kansas City Feds. We asked this question back in May. Here’s Time’s take on the productivity puzzle. A former, sans-MBA management consultant shares the 19th-century “scientific management” origin story…and then methodically tears it down with philosophy. The author also makes a captivating case for the applicability and relevance of a philosophy degree in the working world...and challenges the perceived value of an MBA. On the topic of philosophy in business…So long as we are working with humans, we are working with office politics. HBR explores the mindsets and behaviors that drive office politics and how effective leaders use them to create an office environment where politics are at productive, not dysfunctional, play. “Millennials are on track to be the least entrepreneurial generation in recent history,” so testified John Lettieri, the co-founder of the Economic Innovation Group, before the U.S. Senate in July. The economic realities of debt-saddled Millennials are making them risk-averse, shattering the idea that they’re entrepreneurial phenoms. What does this mean for the competitiveness of our economy?